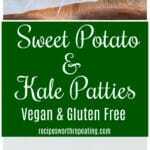 Sweet Potato and Kale Patties are both vegan and gluten free. 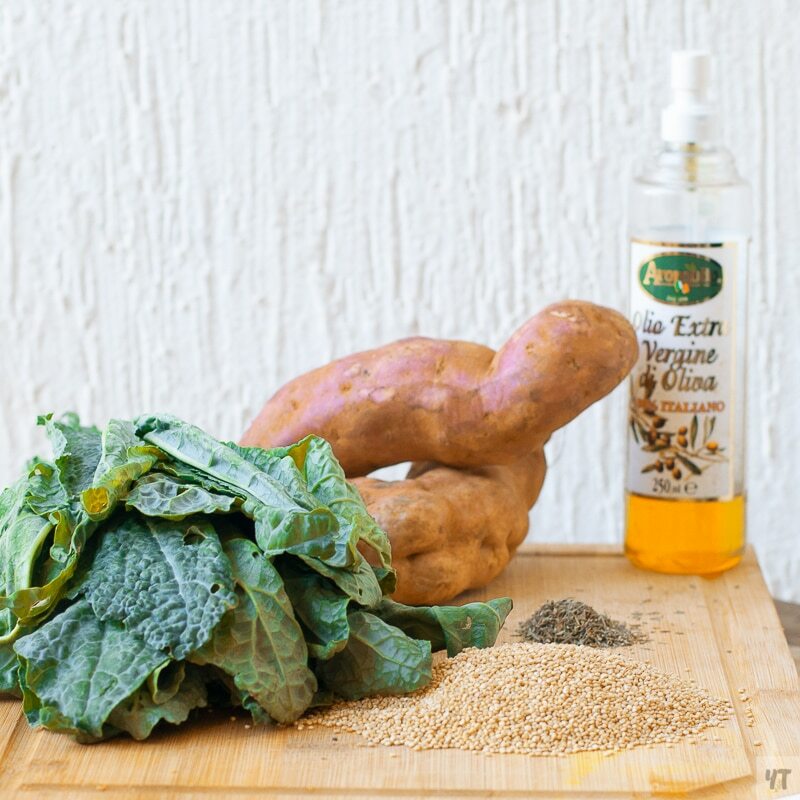 The sweetness from the sweet potato compliments the earthy flavors from the kale and quinoa. Made with only the simplest ingredients, this recipe is perfect for any weeknight dinner or a Sunday picnic with the family. Before we dive headfirst into these nutritious and DELISH patties, let me tell you about myself! I am Chhavi from yellowthyme.com. I am a mommy to a small little boy, an unapologetic foodie, self-taught and self-proclaimed Cook & Food Photographer. I write about some old, some new, little wacky, at times decadent and mostly healthy recipes! 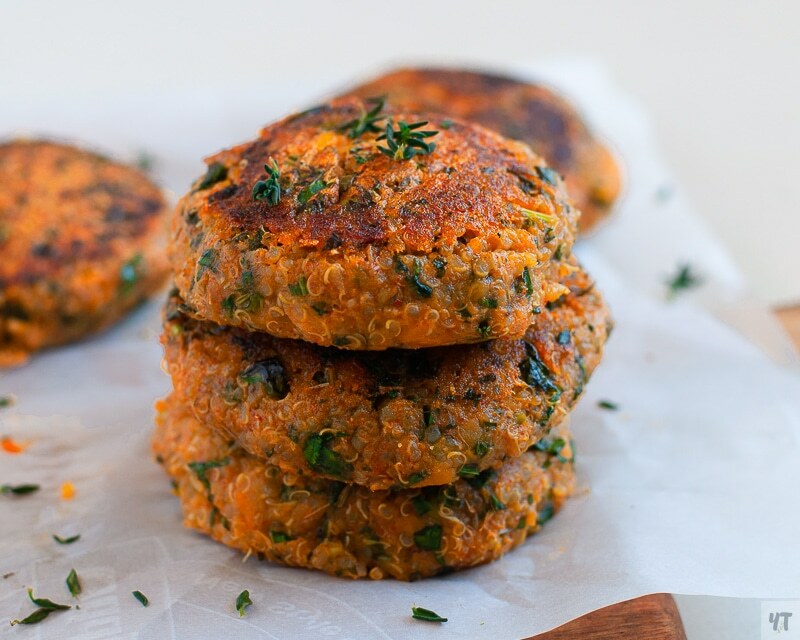 So let’s jump into these Sweet Potato and Kale Patties! First thing you should know…they are super delicious. They’re like nutrient bombs! And the kids love them! I want you to think veggie burger for a minute. 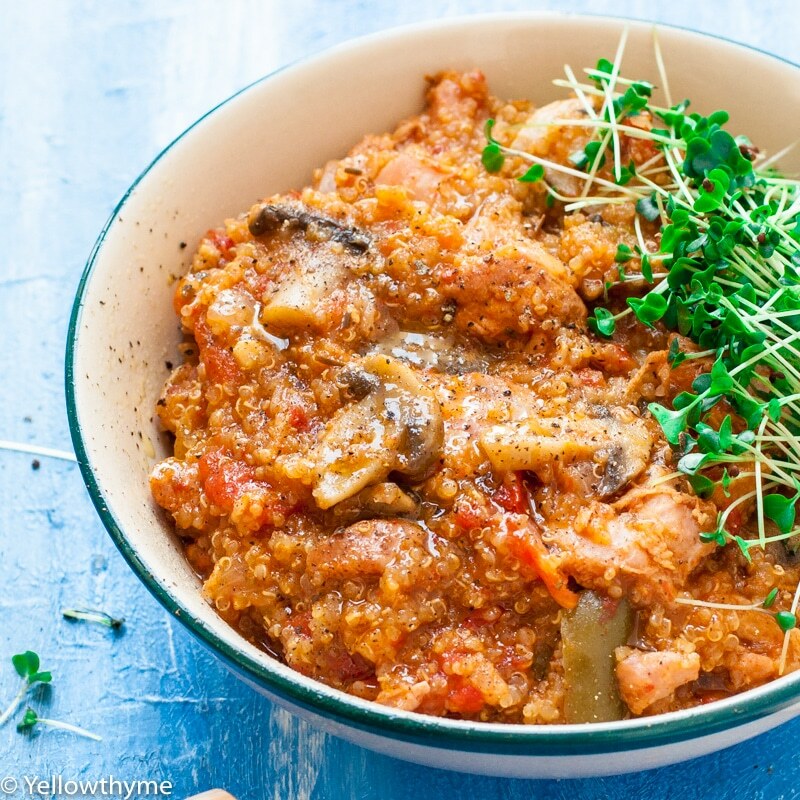 Very similar, but this version is made with sweet potatoes! You can call them what you want though…patties, fritters or veggie burgers. Regardless, they are full of flavor and you’re going to be blown away by the taste and how easy it is to make these! Combining kale, sweet potato, and quinoa is such a winning flavor combination. You’ve got the sweetness from the sweet potato that compliments the earthy flavors from the kale and quinoa extremely well. 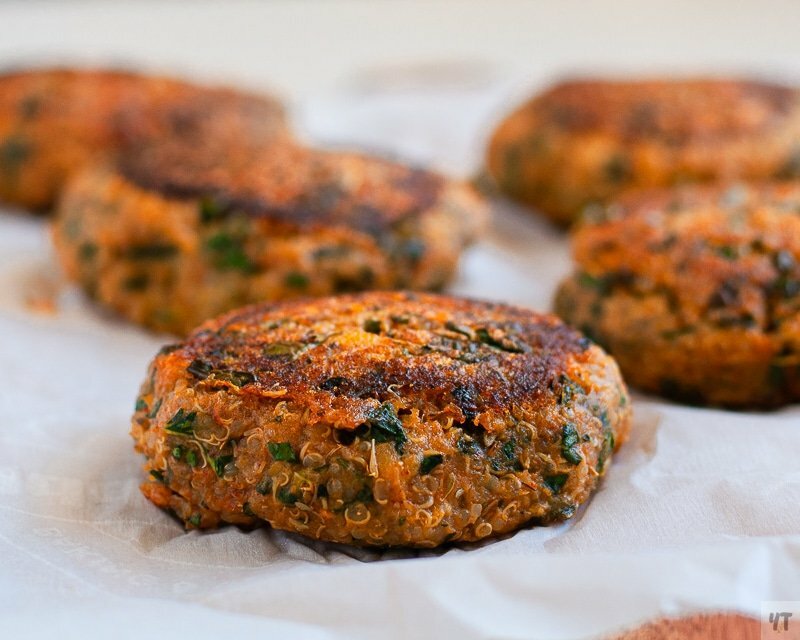 Really, it only takes 4 main ingredients to make these patties – kale, sweet potato, quinoa and olive oil. The rest of the ingredients are just flavorings which can be changed per your liking and preference. There are only two steps before you dive into the frying of the patties. So let’s jump right into it, shall we? First, you’re going to cook the sweet potato. I have made this recipe with boiled sweet potato, baked and diced sweet potato and a whole roast sweet potato. You’re going to get the best texture and taste from roasting a whole sweet potato with the skin on. Once the sweet potato is done, go ahead and mash it up in a bowl. But remove the peel after you mash them. Next, you’re going to cook the quinoa per the packet instructions. Leaving the quinoa a little el dente gives a nice texture to the patties. In a bowl, combine the mashed sweet potato, cooked quinoa, chopped kale, dried thyme, and garlic. Season with salt and pepper. Mix everything together. Take about 2 Tablespoons of the mixture and form into patties. Heat a non stick pan and a teaspoon of oil. Cook the patties 2 minutes per side until they are crisp and golden brown. These patties have a wonderfully crisp and golden exterior with a super soft interior. Every bite of these Sweet Potato and Kale Patties will hit your senses with a mix of sweet, salty and earthy flavors. Do you have an Instant Pot? You can cook the quinoa in your instant pot with 2 cups of water. Let’s talk about switching up the ingredients. This recipe screams versatility! 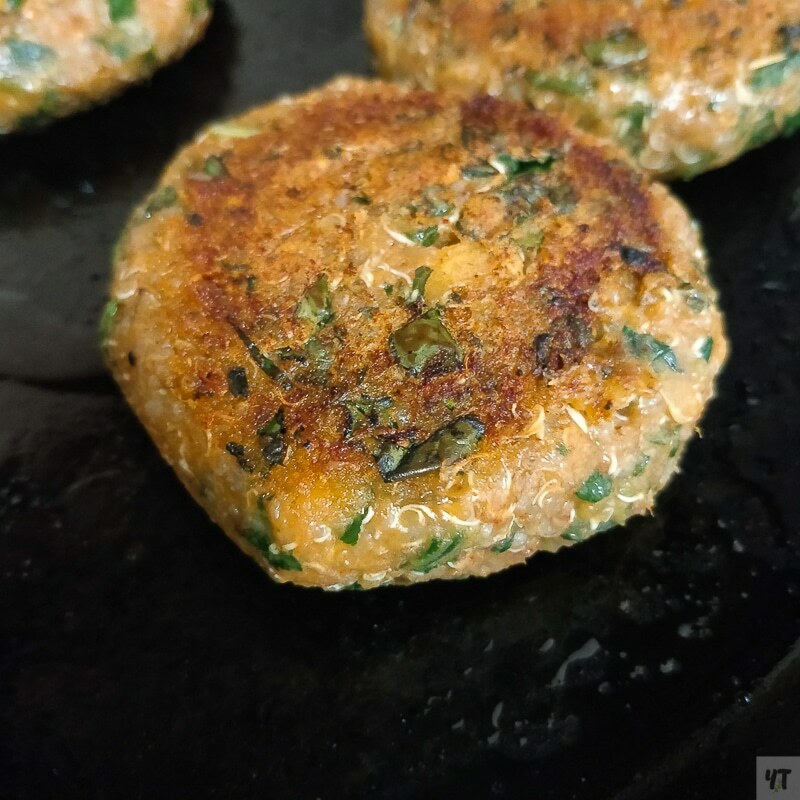 Thyme goes famously well with sweet potato and kale but you can give these patties an indian twist by adding a teaspoon of your favorite curry powder instead. You could even give these patties a Moroccan twist by flavoring them with some fennel seeds and serving it with a dollop of yogurt on top. This recipe is not only vegan but also gluten free. These patties also freeze beautifully. Oh the possibilities are endless!!! My son likes to gobble them up with ketchup (yeah, don’t ask!) but I love to stuff these inside gluten free pita bread or just a few leaves of fresh iceberg lettuce. You could even make burgers with these patties gluten free buns. If you loved these Sweet Potato and Kale Patties, give this recipe a star review! Also, snap a picture of your finished dish and share it with me on Instagram using the hashtag #recipesworthrepeating and #yellowthyme and tagging me @yellowthyme and @recipesworthrepeating. These Sweet Potato and Kale Patties are both vegan and gluten free. The sweetness from the sweet potato compliments the earthy flavors from the kale and quinoa. Perfect for dinner, lunch or a snack! Bake the sweet potatoes in the oven for about 40 minutes. Peel and discard the skin. Mash the sweet potato. Cook 1 cup of quinoa as per packet instructions. I cooked it in my instant pot with 2 cups of water. In a bowl, add the mashed sweet potato, cooked quinoa, chopped kale, dried thyme, and garlic. Season with salt and pepper. Mix everything together. Take about 2 Tablespoons of the mixture and form into patties. Heat a non-stick pan. Add a teaspoon of oil. Cook the patties 2 minutes per side until they are crisp and golden brown. 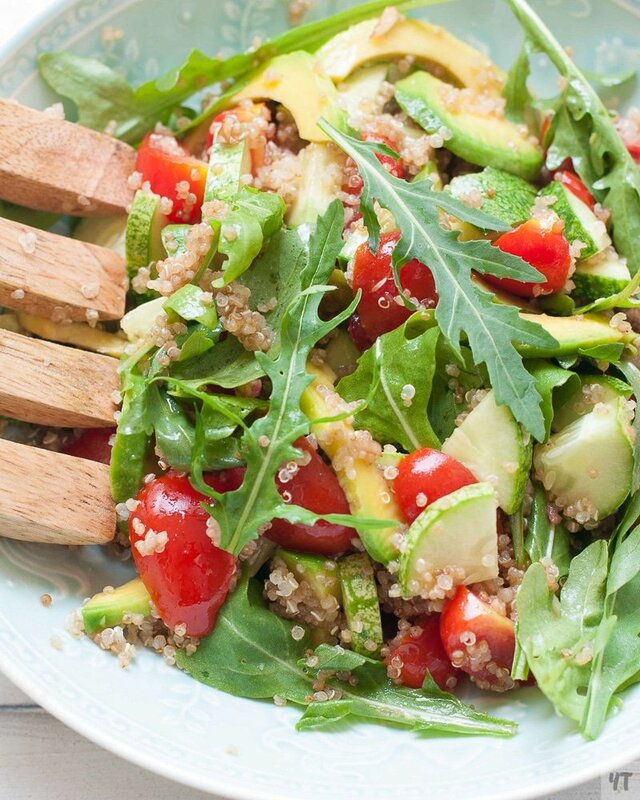 Looking for more Amazing Quinoa Recipes? 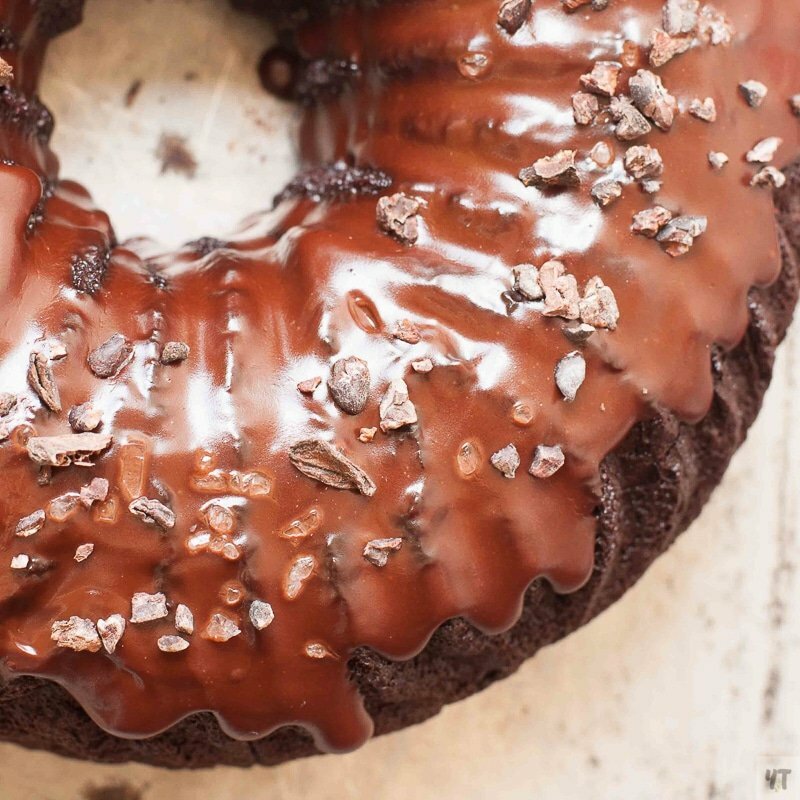 Moist dark chocolate cake made with cooked quinoa.This is a dairy free, gluten free ABSOLUTELY delicious chocolate cake. Easy weeknight dinner recipe made in UNDER 30 minutes with both stove top and Instant Pot methods. Super yummy salad with my favorite Balsamic vinegar and shallots dressing! Oh gosh, these look amazing!!! Thanks, Kelli!! They are delish!! Hi Kylie!! Let me know how they turn out!! Oh these look yummy! I’m all about healthy and delicious. 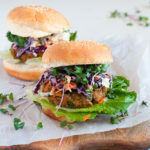 I love veggie burgers especially when they have sweet potato in them! yes! You;re going to love these!! I think the sweet potatoes make these patties! Ooh I like that these have quinoa in them. I’m always skeptical of making veggie burgers as far as the hassle of making them at home but I’m loving everything in these and they don’t see that difficult! Can’t wait to try! Yep – simple ingredients!! You’ll love these!! I’m always looking for new ideas for meatless Monday, and these would fit the bill! 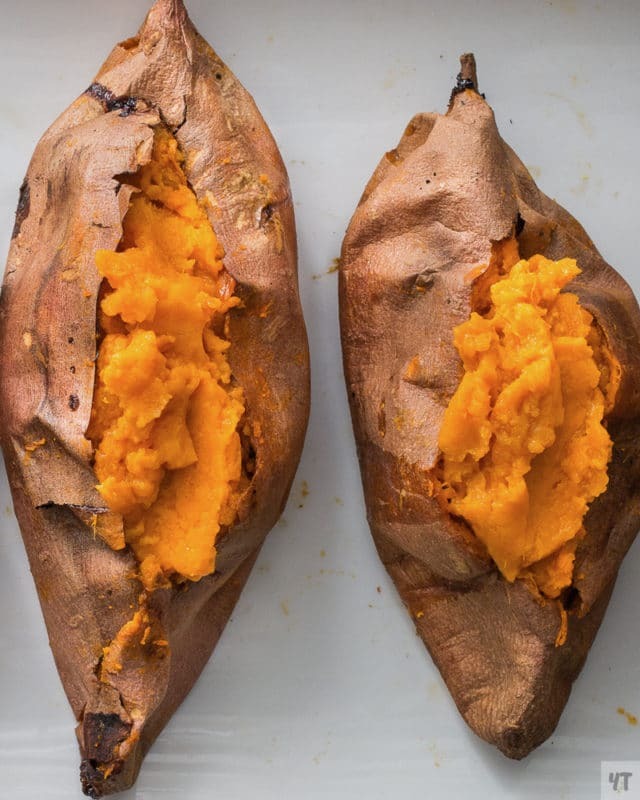 My boys are HUGE sweet potato fans, so I bet I could even get them to enjoy these! Yeah – I bet they will love these! I love the combination of the kale and sweet potatoes! This is perfect for Fridays during Lent! So much flavor! Yes, exactly!! Perfect for Lent!! Enjoy! 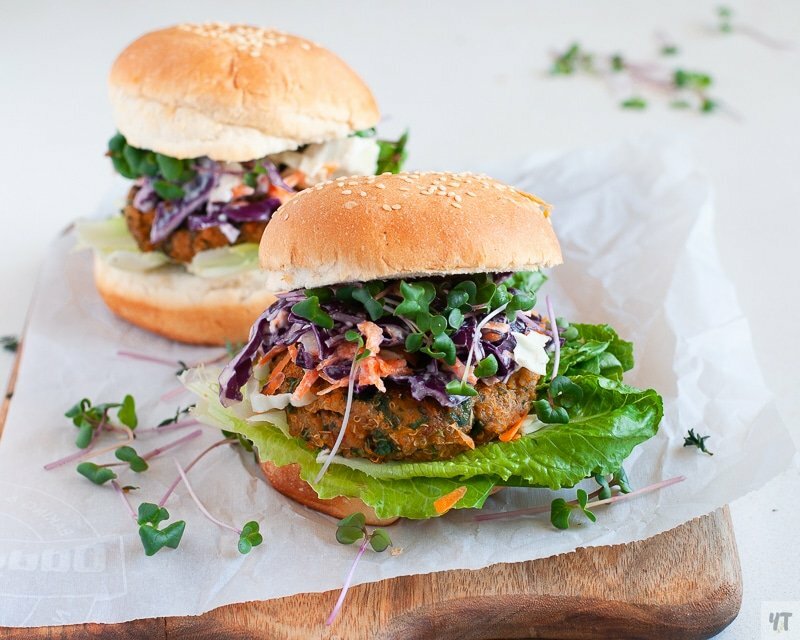 These burgers are perfect for Meatless Mondays and with lent upon us they are perfect for my lifestyle. The bonus is they are loaded with power foods. Yes! You nailed it! The perfect recipe for Lent and Meatless Monday!!! Enjoy and let me know what you think!!! Love the ingredients of these patties! Look great and I’m sure they are super delicious!